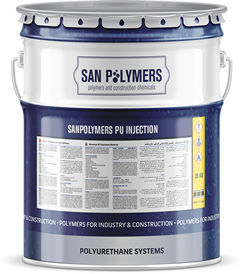 Since 1965, being a strong player in worldwide construction industry, SanDeco started to serve through the Polyurethane Waterproofing System sector with SanPolymers brand. With its sister company, developing and producing liquid application polyurethane waterproofing membranes, primers and floor coatings by offering bespoke solutions to the market. Investing on R&D department heavily; blending innovation, reliability and dedication, SanPolymers offers wide range of high-tech products with the ideology of never compromising the quality. By this way, SanPolymers is passionate to meet all market needs with having the right range in high quality. Polyurethane waterproofing membranes, sealants, polyurethane injection, polyurethane primers and floor coatings with epoxy and its primers, SanPolymers added a variety of products to its range with international certification approved and trustworthy partnership service. SanPolymers aims to build up a worldwide distribution network channel with its trusted business partners and extensive experience in the sector. SANPOLYMERS PU 1C 111 is a one component polyurethane based liquid waterproofing membrane with being UV stable, low viscosity and elastic features. Product provides durable and highly elastic membrane by curing the humidity. 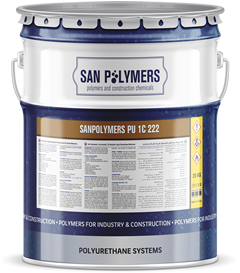 SANPOLYMERS PU 1C 222 is a one component polyurethane based liquid waterproof ing membrane. Product provides durable and highly elastic membrane by curing the humidity. SANPOLYMERS PU BITUMEN 2C 444 is a two component, fast curing Polyurethane based bituminous elastic and cold applied liquid membrane. It provides excellent adhesion to many type of surfaces by being highly elastic membrane. with humidity and produces a transparent, highly durable and elastic f ilm. SANPOLYMERS PU 2C SF is a two component, solvent free, polyurethane waterproof ing membrane specif ically designed for drinkable water tanks. 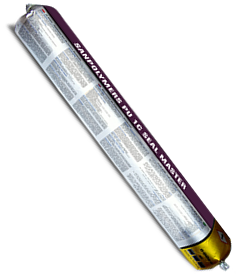 SANPOLYMERS PU 1C SEAL MASTER is a one component joint sealant based on moisture cured polyurethane. SANPOLYMERS PU INJECTION is one component closed cell, low viscosity polyurethane injection gives a blowing reaction when it meets with the water. This polyurethane waterproof ing material specially designed to seal off to the f low of pressurized or non-pressurized water leaking from the cracks on concrete surfaces. SANPOLYMERS PU 1C PRIMER is a one component transparent featured Polyurethane based primer. SANPOLYMERS PU 2C PRIMER MT is a two component Polyurethane based moisture tolerance primer. SANPOLYMERS PU 1C TILE PRIMER is a one component special adhesive primer for non-porous surfaces. SANPOLYMERS PU 1C UV TOPCOAT is one component, aliphatic, UV resistant Polyurethane based topcoat membrane. Product cures with the humidity and produces a transparent f ilm and by this way it provides excellent adhesive over the entire surface. SANPOLYMERS 1C STONE BIND is one component, solvent free polyurethane based, UV stable natural stone binder. SANPOLYMERS 2C STONE BIND is two component, solvent free polyurethane based, UV stable natural stone binder. SANPOLYMERS 2C EPOXY PRIMER is a chemically cured, two component, solvent free primer. SANPOLYMERS EP 2C SF/MB PRIMER is a chemically cured, two component, and solvent free moisture barrier primer. SANPOLYMERS EP 2C WB/MB PRIMER is a two component, water based epoxy primer with moisture and chemicals barrier features. SANPOLYMERS EP TOPCOAT PAINT is a two-component solvent free epoxy top coat, chemically cured and resistant to chemical and physical attacks. SANPOLYMERS EP 2C 333 is a two-component solvent free epoxy top coat, chemically cured and resistant to chemical and physical attacks. SANPOLYMERS EP 2C 555 is a two component solvent free epoxy finish with chemically cured, resistant to chemical and physical attacks features. SANPOLYMERS EP 2C ORANGE PEEL is a two component solvent free epoxy finish with chemically cured, resistant to chemical and physical attacks features. SANPOLYMERS EP CLEAR TOPCOAT is a two component, solvent free, transparent and colorless topcoat. The surface that it is being applied, does not get yellow or loss it transparent feature.